A Charming Country House located in the outskirts of Camarles . Confortable house surrounded by trees in a peaceful sunny location in the countryside . This 2 bedroom Villa of 155 m2 has everything to make the perfect holiday . The house consist of a cosy Kitchen a charming living dining roomwith fireplace, 1 bathroom with shower, 2 double bedrooms and 1 porch of 14 m2 and one roof terraceof 12 m2 storeroom and utility room . Approx 150 m2 are in total all on one floor . 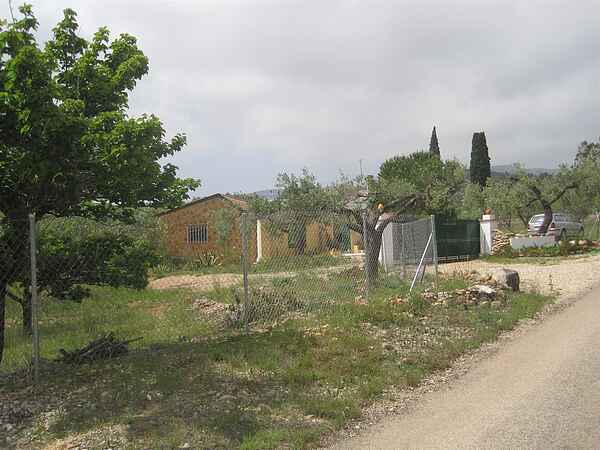 Around 1 ha of land with olive terrace, almonds, fruit trees and pinestrees, well maintained with fenced . The House is set in 8000 m2 of natural maintained mediterranean garden . Barbecue area at the garden . Very good road access . 6 km from the center of Camarles and 9 km from the sea . 70 km from Tarragona city , Port Aventura 25 minutes by train . Buntmont Golf course close by . Lovely location and excellent viewa to the sea , ideal for country lovers . 45 m by car Reus Airport 60 km . 9 Km Natural Park Delta del Ebro . Pets are admited, We love pets !! ATTRACTIVE AND SECLUDED PROPERTY SITUATED 6 KM FROM THE VILLAGE OF CAMARLES . AROUND 1 HECTARES OF LAND WITH OLIVE , ALMOND AND PINE TREES . IDEAL FOR COUNTRY LOVERS .